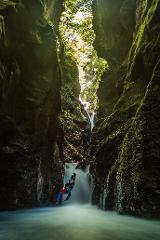 Our most popular trip involving several abseils, lots of sliding, jumps big and small (optional), zip-lines and a few other things besides. Minimum numbers 2 clients for trips to run. 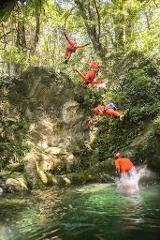 Our most popular trip involving several abseils, lots of sliding, jumps big and small (optional), zip-lines and a few other things besides. One of the most beautiful canyons we have seen. 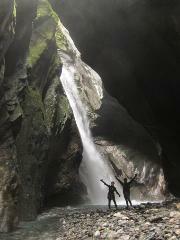 Emerald pools and incredible sculpted rock passages, all set in deepest rain forest. This canyon seems especially made for jumping! Sporty fun in the most fantastic setting imaginable. An exquisitely beautiful canyon in the heart of West Coast rain forest. Explore deep pools nestled in a stupendous sculptured stonescape. 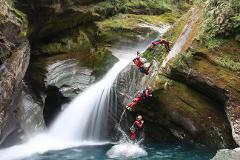 Jump, swim and abseil the most beautiful abseil of your life. Steeper and deeper! 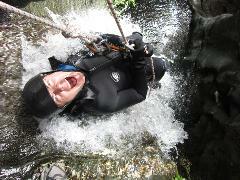 Exciting abseils in strong water flows take you into and behind spectacular waterfalls. Minimum numbers 2 clients for trips to run. Deep and dramatic without being too gnarly, the emphasis here is less on jumping and more on abseiling – start small and finish big! 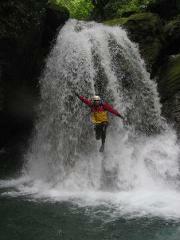 A committing and spectacular trip with a real taste of wilderness canyoning. 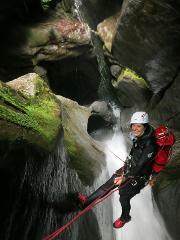 Ultimate satisfaction adventure in a sensational alpine wilderness. Heli in, descend an amazing water-carved ravine and then jet-boat out! A stonking all round adventure with high water flows and a dramatic location. Massive blue pools with some exciting jumps. 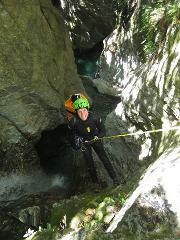 Big-canyon atmosphere at an intermediate level, with a spectacular exit. A physically magnificent canyon carved deep into mother earth. At times you can’t see the sky, at others you’re a fly on the wall. The jumps need commitment. You’ll get hammered in waterfalls. You’ll be blown away – no doubt! Start higher up – go even bigger! Longer, more physical, more difficult, just… bigger! No-one else guides stuff like this.